Learning Off the Grid! The beginning… – CONNECT! 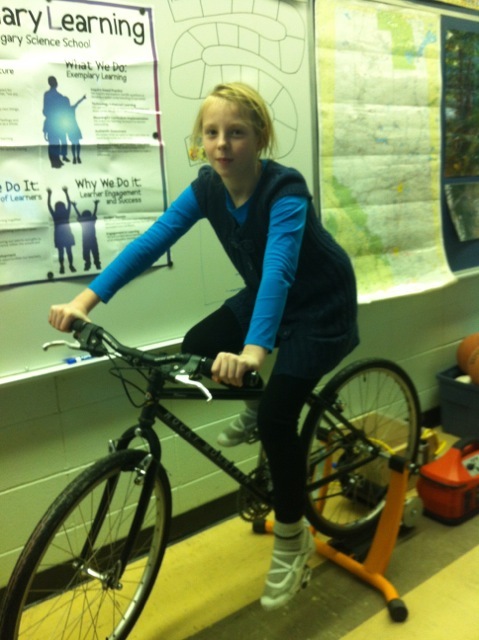 Editors note: Greg’s classroom was just featured on Canadian Geographic’s the Energy Diet Challenge. One of Greg’s students recently wrote a letter to the editor of the Calgary Herald. To read that letter, click here. Electricity is an abstract concept to most students who simply flick a switch and “voila”, they have all the power they need. In order to make this project successful and to meet our objectives, we need our students to develop a more concrete understanding of electricity and specifically about how much electricity we use in our classroom each day. I purchased a number of Power Meters, which we plugged into every electrical outlet in the classroom and we have used a variety of techniques to measure the use of other loads such as lighting and our LCD projector. With a more complete understanding of how much energy we use each day, we can begin reducing our electrical consumption to a point where it will be possible to generate all of our electricity from the bicycle generator. At the moment, we have set up and tested the bicycle-powered generator and we are currently collecting classroom data, which will inform the next steps of this project. Great framework for students to understand what it means when we flick a switch. Greg, congratulations on being featured in Canadian Geographic! As well, I enjoyed reading your student's letter to the editor describing your project in the Sunday Calgary Herald. Through your ingenuity you have embarked on a very exciting exploration associated with the significant challenge of taking your classroom off the electrical grid. Your classroom has become a living laboratory and you and your students are engaged in what could best be described as an authentic learning experience in which you are exploring a very significant real life challenge and demonstrating environmental stewardship. Previous Previous post: Parent Engagement: What does the research say?